Shah Rukh Khan’s production house Red Chillies Entertainment brings an intriguing mystery thriller directed by Sujoy Ghosh, Badla. In itself, this would be plenty to get excited about but there is Taapsee Pannu, an actress very much on the rise in Bollywood, and just for good measure the king of revenge, Shehnshah himself, Amitabh Bachchan. Much fun has been had with little teaser trailers in this but not much has been spoken about the music. Shah Rukh has not spared the cash in this department though bringing in Amaal Malik, Anupam Roy and Clinton Cerejo to put together a 5-song soundtrack. The album is book ended with Kyun Rabba. Both are written by Amaal Malik for Armaan Malik’s harmonious, soft tones to give the lyrics a gravitas. An acoustic guitar, violin and bass drum provide the backing to a song asking God for answers that don’t seem to come. “Dhadak ne ke liye, dhadkano mein kuch na bacha” couldn’t really be sadder but the softness of it all stops it being a time for tissues but plenty emotional all the same. A tabla and towards the end a bass electric guitar bring the song to a comfortable close. The surprise in the second part is not the scarcity of even these instruments, as would be expected in a reprise, but in the lyrics showing this to be a look back… as if having come the full way down the path, it was realised to be a circle. Amitabh Bachchan takes to the mic for the next song Aukaat. And for him Clinton Cerejo has put an almost Bond-esque sound, mixing together a Spanish guitar, bass drum and synth. Amit Mishra and Clinton Cerejo provide backup but its obvious from early on Amitabh’s voice rules over all. A fast, edgy number, its supreme shortness limits how much time an audience has to appreciate it at all which does prove to be a downside to this piece. But still hard to get past listening to Amitabh sing again! Tum Na Aaye is an Amaal Malik special for KK. Unlike ‘Kyun Rabba’, Amaal gives KK plenty of orchestration to support forcing KK to let rip on “Sab aaye, ek tum na aaye”. During the bridges, listeners are treated to high flowing notes from KK’s voice which are angelic in their nature. But this not some soft song… this is yelling out with a full rock band behind for backup. This is pain, not anger, not sadness; just pain. For the final song, there is the title song Badla. Anupam Roy writes and sings the song himself with a slow, street beat. Finger clicking for rhythm, synth, bass drum and guitar make up the beat all hiding behind Anupam’s easy listening voice. To be honest though this is all a bit too good to be true and could have used a better singer, as Anupam fails to really take front position and often allows the orchestra to stand above. This means the lyrics which listeners should have been able to concentrate on quickly disappear in a series of disparate sounds. It only gets worse towards the end with clapping replacing the finger clicking and the lyrics seeming to give up. 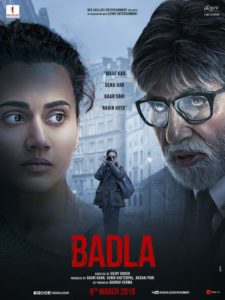 Badla seems to be a great film due to its likely many twists that are obvious even from the trailer. However, the combination of music directors has left this album with a mixture of sounds. Amaal has given the singers all the power, Anupam has made a title song which might as well have been instrumental and Clinton has brought forward Amitabh Bond. In these circumstances, while it may fit the film itself very well, it’s not possible for it to be a strong album as each is pulling listeners in different directions. Nevertheless, it does mean individual songs will be a hit with certain people, depending on mood, experience and nature, so maybe one for Spotify.